Recently, I sent Mormon novelist, filmmaker, and blogger Margaret Blair Young a list of questions about her current projects with Darius Gray--a revision of their Standing on the Promises novel series and the feature film The Heart of Africa--as well as her own work as a creative writer and president of the Association for Mormon Letters. Kindly, Margaret took time away from her busy schedule to answer them for me. I've split the Q&A into two parts. Answers to the questions relating to Standing on the Promises and The Heart of Africa are featured here on Modern Mormon Men. Margaret's thoughts on her work, Mormon literature, and the Association for Mormon Letters are featured on A Motley Vision. Scott Hales: The original Standing on the Promises trilogy was published a decade ago—which doesn’t seem that long ago to me. Why did you and Darius choose to revise and expand them now? Margaret Blair Young: We have realized that Mormons aren't our main audience. We learned that LDS readers, those who frequent Deseret Book, are looking more for a feel-good book than for the hard (but inspiring) history we tell. So we have revised for greater accuracy, to include new information, and to go about marketing not only to the LDS audience but to a wider one. SH: You originally published the trilogy through Bookcraft, an imprint of Deseret Book. Why did you switch to Zarahemla Books for the new editions? MBY: We have freedom to direct our publicity with Zarahemla, and far more freedom to get our books into places where people are yearning for new information. Black LDS history is American history which few know about. We consistently find that our black audiences are very receptive to our work. They are not threatened at all by it but grateful to learn the stories. SH: Zarahemla Books is known for publishing “unorthodox but not apostate Mormon fiction.” Did that branding affect your approach to the new editions? Did publishing through Zarahemla Books allow you, in other words, to tell your stories in a way that you were unable to do under the Bookcraft label? MBY: Honestly, we were looking for a press which would work well with us, treat us respectfully and with full honesty, and be with us to get our stories out. We're able to direct things in a more hands-on way with Zarahemla than elsewhere. The realization that these stories matter more outside the Mormon belt than within it is a big impetus for us. Of course we'll market within Utah, but we have a much bigger vision which goes beyond the LDS bookstores on the Wasatch Front. SH: Since the publication of your novels, Jane Manning James has reentered the institutional memory of the Church in significant ways. For example, she plays noticeable supporting roles in the new Nauvoo pageant and Joseph Smith: Prophet of the Restoration, which is shown in LDS Visitors’ Centers around the world. What is it that attracts us to Jane? 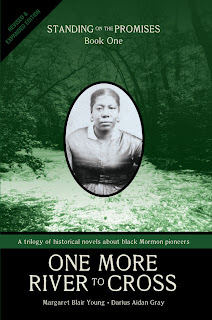 Why have we made her story the archetypal story of the black Mormon pioneer? In your opinion, what aspect of her story are we not telling that we should be telling? MBY: Jane's story shows us that Joseph Smith treated Nauvoo's citizens of color well, which matters in the re-framing of the LDS experience within a global context. However, we tend to tell the first part of her story, not the whole thing. Even in the Joseph Smith film, Jane's faith is subsumed by Joseph's story. He wraps her bloody feet in the mansion house. Actually, Jane's report says that the Mannings prayed for God to heal their feet, and their feet "were healed forthwith." She adds that they afterwards went on their way "singing, rejoicing and praising God for healing our feet." As we go with Jane to Salt Lake, the priesthood restriction becomes a sad reality for her as she petitions time and again for temple blessings. She is permitted to do baptisms for her "kindred dead," but is never allowed to go into the temple for her endowments. Even when she is sealed as a servant to Joseph Smith, it's done by proxy, Bathsheba Smith representing her. But amidst such trials, we need to look at how she chose to end her own life story. Despite her deferred dreams and unanswered prayers, she closes her story (which she instructed should be read at her funeral) by bearing her testimony, and proclaiming it "strong, nay if possible stronger than it was the day [she] was first baptized." SH: What has been the response to Standing on the Promises over the past ten years? How do you hope readers will respond to the new editions? MBY: Book one did well. It tells the first parts of the black pioneers' stories, during the Church's early years. Sales for book two dropped dramatically compared to the first book. We cover the priesthood restriction in that second book, as well as the lynching of Sam Joe Harvey--a tragic event which Elijah Abel himself tried to prevent. For whatever reason, publicity for the third book dropped off dramatically. In fact, a $20,000 film project intended to advertise our series was summarily dropped by Deseret Book after it was filmed. We still don't know the full story about that, and I doubt we will. Nonetheless, we made the best of a bad situation and turned the footage into a short documentary Jane James: Your Sister in the Gospel. There are still people who don't know that the third book was ever published. It is the most historically accurate of all three, because we had thorough records as we wrote it. We are eager to market the trilogy as a set, which we were not able to do previously. We aim to debut the set at the Mormon History Association conference on June 7th (my birthday). SH: The earliest black character I know of in Mormon fiction is a character named Louisiana Liz, the murderous “octoroon paramour” of a sleazy army captain in Susa Young Gates’ John Stevens’ Courtship (1909). Obviously, I think your novels prove that Mormon fiction has made some significant progress in the way it depicts people of color. At the same time, however, I think Mormon fiction remains a relatively white subgenre of American fiction. Do you see that changing anytime soon? 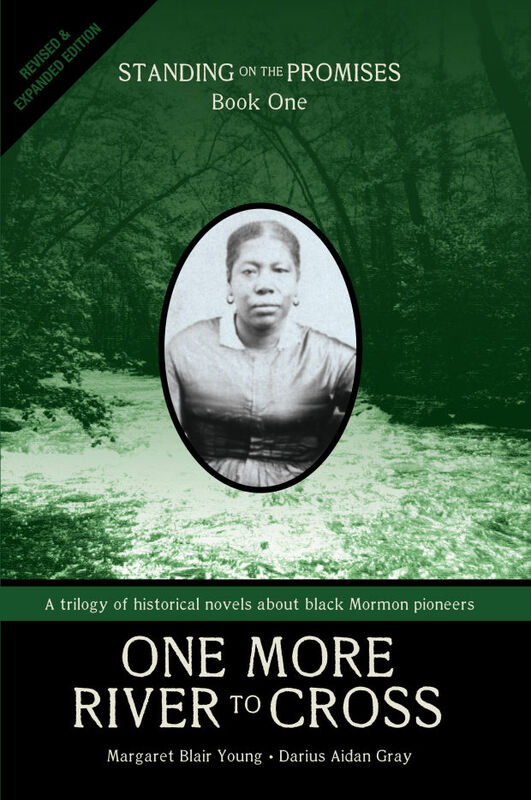 Are you aware of any other Mormon writers who are telling stories about African-American Mormons, or Mormons in international settings? I mean, beyond missionary stories? MBY: We've just had two books about Elijah Abel come out, though they're more of a scholarly type. Mormon fiction is indeed very white. My primary goal as the president of the Association for Mormon Letters is to make our organization an international one, in which we learn about and showcase authors/artists from other countries. It's slow and rather tedious work, but we do know of a Latter-day Saint playwright in Zambia who wrote a number of plays before his death. I intend to get my hands on those and do whatever is necessary to get them produced. My own future projects will definitely go to Guatemala, where I've spent a lot of time, and to China and Russia, where my parents lived for years. I wish I knew of others besides myself. Well, Tom Rogers comes to mind. I am certain we'll find out about others. SH: Tell me about your current project, the feature film The Heart of Africa. MBY: We are excited about it! Because I wrote to a bunch of DR-Congo missionaries from the MTC branch my husband and I were in, I got to experience about a dozen missions--including those of some African nationals. One of the Congolese missionaries had been a revolutionary before his conversion. The scenario of a Congolese man trained to hate all emblems of Colonialism, including Anglos, and a naive kid from Idaho serving together before either has recognized the depth of his prejudice, intrigued me. We intend to make it a compelling piece of cinema with all sorts of anthropological significance. We will honor the dialects, music, and dress of the Congolese throughout the movie. We will also have leadership roles filled by Blacks--in clear contrast to the common model of white missionaries leading the Africans. We invite anyone interested to visit our website: www.heartofafricafilm.com. SH: I notice that one of your protagonists is named Elder Price, a name he shares with the missionary in The Book of Mormon musical. I assume this was deliberate? Should we understand The Heart of Africa as your response to The Book of Mormon? MBY: Oh yes. In fact, I think Parker and Stone should give us some money for furthering the discussion. Frankly, the launch we get from The Book of Mormon will be part of our publicity. SH: Unlike your first film, the documentary Nobody Knows: The Untold Story of Black Mormons, The Heart of Africa tells a fictional story. What are the advantages of fiction? MBY: Fiction can get at truth more directly than non-fiction. In good fiction, we don't need to deal with false memory or various agendas (including self-vindication) interfering with the narrative. A good screenwriter will build characters the audience will love, and provide believable conflict. A good film will linger with the audience for hours or days after the closing titles have finished. We hope our audiences will have the Congolese song "Nzambi Wetu" playing in their heads for hours, and that they'll want that song in future hymnbooks. SH: In your opinion, how does The Heart of Africa dovetail with Standing on the Promises? MBY: Frankly, Darius Gray and I avoided stories from the continent of Africa, because we understood that the African world and the African American one are distinct. But the time simply came. Obviously, race issues are vital to the plots of both the film and the trilogy. SH: What should we expect from Margaret Blair Young after Standing on the Promises and The Heart of Africa? MBY: Expect a novel about an old man who is certain he will not go to the Celestial Kingdom because of secrets he has kept, and his compassionate, gay son who arranges for him to confess to a bishop--and then, after the old man's death, goes about uncovering the secrets. Expect a film set in Guatemala done in Spanish and Cakchiquel (Mayan dialect) which will honor the life of Pablo Choc, one of my heroes. Expect Darius and me to continue working together until one of us dies.